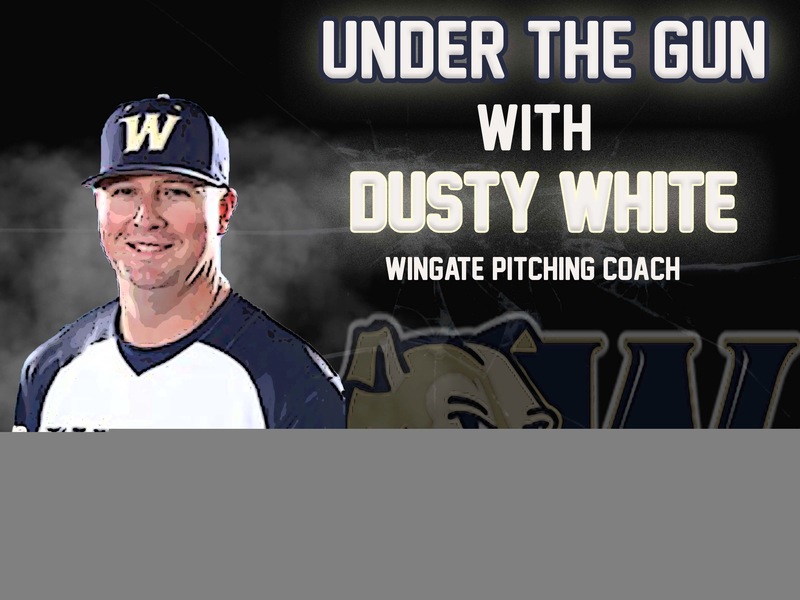 We are lucky to have Wingate University pitching coach Dusty White on Under the Gun this week. He is entering his 4th year with the program in 2019. Coming off a 34-19 season in 2018, how does this spring look to be shaping up and what are you most excited about for the Bulldogs? Thanks to the Dirtbags Organization for asking me to be a participant on “Under the Gun.” The spring has been great so far. The guys have done a great job being focused every day, bringing energy to the field with a desire to get better. We have a lot of competition at multiple positions, which is fun to watch, guys pushing each other every day. We had a great season last year…We graduated a few key bats in the lineup as well as a few weekend arms. With that being said, we also return a lot, and reloaded where needed. The pitching staff will have quality starters, and a lot of depth in the bullpen. All of the guys returning got a taste of regional play last year, and are all eager in hopes of returning to postseason (and hopefully beyond) again. As an alum of Wingate who was part of a SAC Championship in 2010, what does it mean to be able to serve as a coach at a place where you played and were a part of such success? I am very honored and blessed to be able to serve as the pitching coach and recruiting coordinator at my alma mater. I still remember the 2010 season like is was yesterday…It was an amazing year, a season I will remember forever. When Coach Gregory offered me the job four years ago, I’m pretty sure I said yes before he even finished asking, that’s how excited I was the have the opportunity coach college baseball…at Wingate! Hopefully the 2019 season will bring the same result as the 2010 season did, I’m ready to experience a SAC Championship from the coaching side of things. Share with us your journey as to how you transitioned from playing the game into the role of being a college coach. What were some key moments and who were some influential people that made a difference along the way? Growing up, baseball is all I wanted to do… just like every kid, I had the dreams and aspirations of getting paid to play the game. If that didn’t work out, I knew I would be involved in the game, somehow. I knew coaching was something I wanted to get in to because as a player, I had a great desire to learn anything and everything about every aspect of the game. I learned a tremendous amount from various coaches I played for growing up, the staff at Wingate University (Coach Osborne, Coach Gregory and Coach Hall), Mike Shildt, Gary Robinson, my dad, the list go’s on and on. I learned something, whether big or small, whether about baseball or about life, from every coach I’ve ever had. I hope to have that influence on all of my players, past, present and future. As someone who has worked with players to develop not just sound pitching mechanics, but also overall physical preparedness to perform in the game of baseball, what message would you give to those playing youth baseball today? To all the youth playing baseball today…. If you want something, then you have to work for it! Nothing in the game of baseball, or in life, is going to be given to you. If you want a baseball scholarship, work for it. If you want to throw 90, work to throw 90. If you want run a 6.6 60, working on getting faster. That’s what I was taught and that’s what I preach to my players every day. To me, a divine work ethic in the game of baseball will set you up be successful in whichever career path you chose. Give us some insight on how you are able to balance the difficulties of coaching college baseball and life in respect to your responsibilities. Being a college baseball coach is more than a job, it’s a calling for me. Anyone coaching at this level knows the work, time, and dedication it takes to have success on and off the field. From recruiting throughout the summer and fall, fall practice and then the season, there is many off days! It, by no means, is your typical 9-5, Monday – Friday job. However, like Confucius said, “Chose a job you love and you will never have to work a day in your life.” A big part of being a college baseball coach is having a supportive wife. It takes a very special women to put up with the crazy schedule of coaching college baseball, and I am grateful to have her. What advice can you give those those looking to play college baseball and why a D2 program may be a best fit for their careers after high school? Of course, all players wanting to play college baseball would prefer to play at the Division I level. When first recruiting a player, whether local or not, it’s not uncommon to have players tell me they are wanting to wait as long as possible to make their decision in hopes of getting that Division I offer. Regardless of the level, baseball is baseball. The game is the same. I’m trying to recruit the best player that I can, often times the same type of player most Division I schools are. To those with aspirations of playing college baseball, there a several quality Division 2, 3, JUCO and NAIA programs in the state of North Carolina…. Get out this spring and go see some games. I think you’ll surprised, yes the schools may be smaller but the level of competition will be just as great. A big thanks to Coach White for taking some time to give us a glimpse on Wingate Baseball and himself. We’d like to wish him and the Bulldogs well as they go through this spring’s season!